What a great debut novel! It's hard to believe that this is in fact the first novel by the pseudonymous Robert Galbraith; it's so polished and offers the complete literary package. The characters are well-rounded, the plot is intriguing, the back stories are interesting. Cormoran Strike has had a complicated and heart-breaking life, although he has had a sure hand in creating some of the drama in it. Strike is the son of a high-profile aging rocker (think Mick Jagger), via a drug-addicted, narcissistic supergroupie, who died a sordid and much-publicized death. He doesn't really know his father or any of his half-siblings, with the exception of Lucy, his mother's other child by a different father. The army gave Strike a home. As a successful investigator for the military police's special investigations branch, he found his place in the world. Until he lost part of one of his legs in an explosion in Afghanistan. He was demobbed and thrown back into an unwelcoming civilian world. He decided to continue to do what he knew best and hung out his shingle as a private detective. Success, however, remained elusive. At the start of The Cuckoo's Calling, Strike has just left his highly dysfunctional relationship with his beautiful, blueblooded, rich, crazy girlfriend, Charlotte. He is now sleeping on a camp cot in his shabby office and accidentally nearly kills the new secretary sent to him by the temp agency. Although Robin Ellacott's introduction to her new boss was less than salubrious, she is secretly thrilled to be living out a childhood fantasy of working in a detective's office. Of course, in the fantasy, she was the detective. Thus the stage is adeptly and compellingly set for the case of a lifetime. John Bristow is a financial lifesaver when he walks into Strike's office. Strike has no money and apparently owes a large sum to someone who calls on a regular basis to hound him for payment. Life couldn't get much worse when Bristow walks in. Homely and emotionally labile, Bristow has come to see Strike because his supermodel sister, Lula Landry, plunged to her death a few months before. The police have labeled it a suicide, but Bristow thinks it was murder. If Strike thinks his family tree is twisted, it turns out that Bristow can go head-to-head with him on convoluted and skewed relationships. Bristow has come to Strike because Strike was a childhood friend of Bristow's brother, Charlie, who died young. Charlie, John, and Lula were all adopted by an upperclass, childless couple. Lula, half black and half white, continued her troubles after leaving home by becoming involved with other young, disaffected, entitled celebrities. Thus the stage is set for tragedy. When Strike is first seen, he is a disheveled, distraught, and lumpy-but-strangely-attractive disaster. It is a surprise, therefore, when he proves himself to be a meticulous, observant, intuitive, and brilliant detective. Galbraith pleasantly upends stereotypes and frequently pulls out both big and little surprises. The story is not all about Strike. Robin Ellacott thought she knew what she wanted: her fiancé, Matthew, a future stuffed shirt, and a comfortable, responsible life with him. There is no romance between Strike and Ellacott. Rather, the romance is between Ellacott and her almost-forgotten dreams of adventure and daring. She shows ingenuity and compassion. She grows on Strike and on her audience. Lovely long, luxurious lines of storytelling. The 400+ pages are a joy. Had I still the power to grant an MBTB star to a book, one would certainly go to this book. Not part of the Inspector Alan Banks series, Peter Robinson has gone in for Yorkshire gothic with his award-winning Before the Poison. Movie music composer Chris Lowndes buys a home in an isolated part of Yorkshire, leaving his Hollywood life behind. He is still grieving for his wife who died of cancer a year before. Although he was born and raised in England, he hasn't really lived there for decades. His children are grown with lives and families of their own. Now is the time, he thinks, to begin work on a musical work not associated with any movie. As Lowndes wanders around the countryside and within his own vast home, he senses that there is a story behind the house. And indeed, there is. Grace Fox was hanged for the murder of her husband, the local doctor, by poison in that very house. She had a young lover, and the supposition is that she did not want to leave him to move to another town with her husband. Juxtaposed with Lowndes investigation into Grace's misfortune are an account by a sympathetic writer of Grace's trial and a look into the journal Grace kept while a nurse in World War II. If I were giving Robinson an award for this book, it would be for only part of the book, the story of Grace's WWII experience. That piece was truly stunning. Lowndes' present-time story is rather bland, with the exception of the character of Grace's granddaughter, Louise, a watered-down version of Lizbeth Salander. Children and young adult mysteries take up swaths of bookshelf room at your local bookstore, reflecting what publishers have learned: adults buy young adult and kid lit books for themselves. In the past decade, Young Adult (YA) and kid books continued to increase in sales when adult sales declined.Why? I suspect it is because in the pages of a well written YA or book for kids the reader can count on timeless, memorable characters and a no fluff writing style. Summer is a great time to take the plunge into kid lit mysteries. I'll skip past Nancy Drew and the Hardy Boys and point out a few favorites, (without the usual age range labels to distract you). 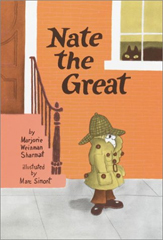 Majorie Weinman Sharmat’s Nate the Great is a classic series. “Sherlock” Nate, his pancake stealing dog Sludge and the cat draped Rosamund are characters you will never forget because they are weirdly just like your neighbors. 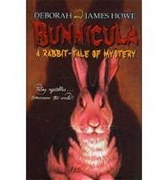 James Howe’s Bunnicula series, starring the pale, red eyed vegetable juice sucking rabbit has been a constant seller since 1979. Where else can you get a protagonist that never says a word? Now that’s mysterious. 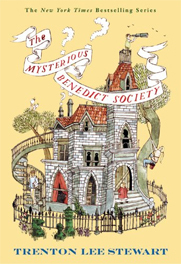 Compelling and rich, The Mysterious Benedict Society by Trenton Lee Stewart is a recommended read for the whole family. It compares well with The Westing Game by Ellen Raskin, in print since 1978. The Enola Holmes series by Nancy Springer is a great alternative to romance fiction and a guilty pleasure of many adult readers. 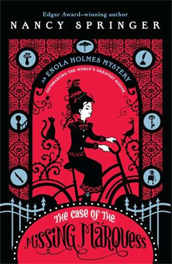 Enola, the independent fourteen year old sister of Sherlock is a “scientific perditorian” in Victorian London, bustles, grime, top hats and all. Start with The Case of the Missing Marquess, which won the Edgar Award for young readers. Dip into the world of Kid Lit Mysteries without the guilt - they are masterpieces of writing and true pleasures. Oregon author/illustrator M.K.Nelson leads the double life of artist and author. A voracious book appetite and a library card are entirely to blame. She writes and illustrates children’s mysteries from her North Portland studio. 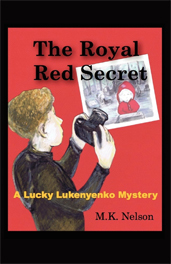 M.K.‘s middle grade mystery novel, The Royal Red Secret, is available from Powells Books, Smashwords, Ibooks and Amazon and other print and e-book venues. You can catch up with her at cloudcoverstudio.com or ask questions about kid lit mysteries by contacting: books@mbtb.com. A Blunt Instrument was the fourth and last in the Superintendent Hannasyde mysteries. Georgette Heyer later formed a series based around the secondary character of Sergeant Hemingway. Although I haven't read any of the others, based on this book, it would appear that the detective character is actually a supernumerary. The police aren't bumbling but they exist to go down the list of most likely suspects, then to throw red herrings into the mix, before finally solving the case. Actually, that's an unfair characterization of Hemingway, who shows flashes of humor and gets in some comedic dialogue, especially playing off of PC Glass, the Bible-thumping, pompous constable who calls in the murder. This book, more than anything, is an upper class romance wrapped around a murder mystery. (Although Christie's books also had strong elements of romance, it shared equal billing with the mystery.) While the detectives plod with both their techniques and dialogue, the other characters are highly individual, sharp and wonderful embodiments of "the usual suspects." The dead body is played by Ernie Fletcher, a rich ladies' man. His household includes his sister, Lucy, a dithery, socially awkward and snobby spinster; and his nephew, Neville, who is by far the best character, by turns insouciant, irreverent, blithe, and mischievous. Debt-ridden Neville especially is a prime suspect. Good old Uncle Ernie was not just charming to the ladies but underhanded in his dealings with them as well, as it turns out. He holds IOUs for gambling debts incurred by Mrs. North, a comely neighbor, whose husband would not countenance her indebtedness. Mrs. North does not know which would be worse, that her husband is jealous of Ernie or that he isn't. They, too, are prime suspects. There are other suspects and victims, one of whom begins as one and ends up as the other. All the elements of a classic mystery are at the ready. The amount of dialogue irritated me at first. It took half the book before I stopped gritting my teeth whenever one of the suspects would start in to make a point. The point was usually obfuscated first by dithering, temporizing, and non sequiturs before being made. PC Glass with his Biblical quotes and dour looks irritated me the most. His superiors barely tolerated him, and I would have sentenced him to patrolling sheep pastures for wolves were I in charge. By the second half of the book, however, I started to enjoy it. Neville and Sally, Mrs. North's sister and a "crime novelist," bantered charmingly and tolerated Mrs. North's attempts to be her own worst enemy. A lot of the peripheral characters appeared fully, even if they only had a paragraph or two to call their own. There is certainly a charm, however dated, to this upper class play of morals, and I can see why Heyer was popular, even during England's depression and the years of war. This is just pure escapism. A customer from South Africa once came into MBTB's store (in Portland, Oregon!) and said Deon Meyer was the best mystery author in South Africa. At that time it was hard to get copies of his books. It's still not easy, but he thankfully is published in the United States (before his books quickly go out of print). Of everlasting mercy is the fact that most of his books are standalone novels, so a reader won't miss the latest kerfluffle in a series' baseline story, bringing reading to a standstill because of a missing title. Meyer's books are written in Afrikaans and must be translated into English. As opposed to Afrikaners, the ethnic group of Dutch-descended whites, Afrikaans, a Dutch-descended language, is spoken by a wide group of different ethnicities in South Africa. (For more information: http://en.wikipedia.org/wiki/Afrikaans.) Meyer, who speaks English, has made it a point to publish in Afrikaans. It's important for Meyer's main character in Blood Safari, Lemmer, to speak Afrikaans as a way of negating the bad reputation it has, i.e., it's a common man's language, unsophisticated, not as good as English. Meyer, too, it seems is making a point by publishing in Afrikaans. Blood Safari is a long book (556 pages in my paperback version). It is divided into three segments. It is like a Tootsie Roll pop: hard on the edges (books 1 and 3) and soft on the inside (book 2). Despite the "thriller" designation, this would be at home on the private eye, hard-boiled shelves. At first, I thought it was a tough guy, silent hero type of book, à la Clint Eastwood's "Man with No Name" or Lee Child's Jack Reacher. And the first and last parts don't disappoint, if that's the style you want. The soft Tootsie Roll center covers the back story of Lemmer -- who has a first name, but he doesn't like it, so we pass on gratuitously mentioning it. This section lays out why he doesn't like his name, why he is the way he is, why he was in prison, why, why, why, until the center and scenery are all chewed up. It's a sob fest, but a well-written, eye-opening, ingenious sob fest. It is the romantic hero's (but not in a Fabio kind of way) story that makes Meyer's book distinctive and distinguished. In brief, Lemmer is an operative for a South African firm that supplies bodyguards and security for (usually) high-level individuals. A woman has hired Lemmer's firm because she was attacked by masked men. She escaped but she suspects they will be back. She thinks it might have something to do with her search for an older brother who disappeared 17 years ago. Lemmer is not a private eye, so he doesn't pretend to help her solve her problem. But when the bad guys have another go and Lemmer is caught in the cross-fire, he now has a personal stake in finding out what is going on. What is going on is related to several sensitive issues in contemporary Africa: development, environmental impact, wildlife preservation, tribal and ethnic concerns, hold-over ethics and problems from apartheid. Meyer does a standout job of twisting these issues in a nefarious way into his story. This is worth the 500+-page journey. There's a lot of meat with no filler.